Urban areas import the young and export the old, the theory goes, or went. For decades, young people have come to Virginia’s urban areas to go to university or work, often moving out again when their children require more space or education, or when they retire. But, since the mid 2000s, a demographic change has slowed the conveyor belt of movement in and out of cities. More young families are staying in Virginia’s urban areas to raise their children and enroll them in local schools, fueling the strongest population growth many of Virginia’s urban areas have experienced since the 1950s. Though many young couples in the past have started families while they lived in urban areas, a good number would move to suburban counties before enrolling their children in school. 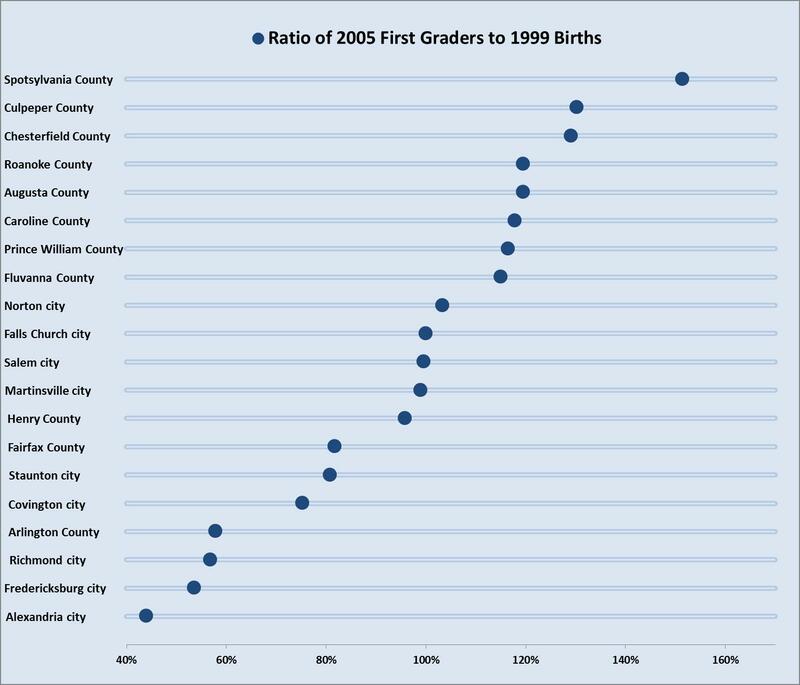 In urban school divisions such as Arlington County and Fredericksburg, fewer than 60 percent of children born in 1999 showed up in first grade in 2005. 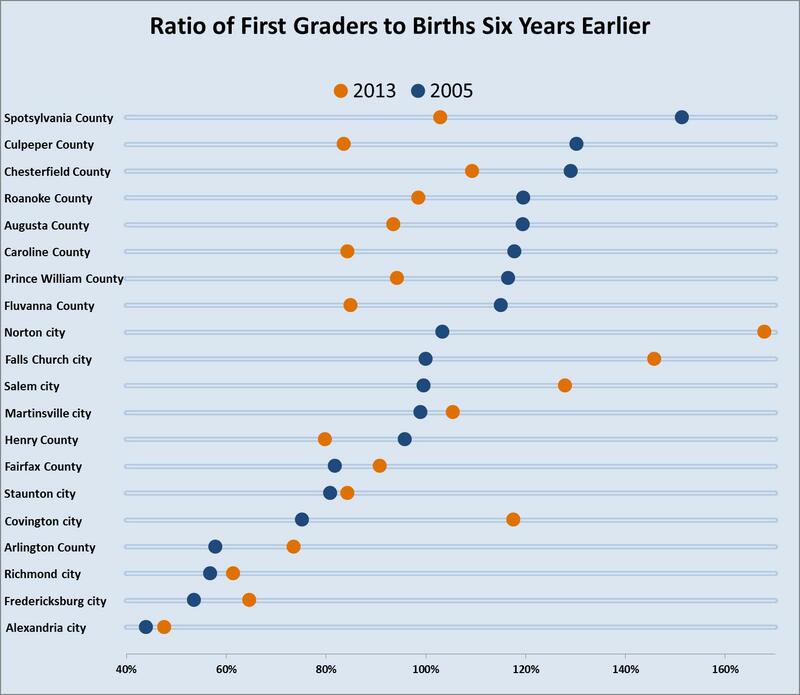 The large number of young families moving into suburban school divisions caused many more children to enroll in first grade in counties such as Spotsylvania and Chesterfield than were born there six years earlier. Today, many parents are staying put in urban areas, thanks to stricter mortgage regulations that make it hard for buyers to get a loan, and a difficult labor market that makes it hard for anyone to be sure of a job. One-third as many homes were sold in 2012 as in 2005 in Virginia. During the same period, the Census Bureau’s American Community Survey shows that the number of Virginia families with children who live in a rented residence has increased 15 percent. A weak real estate market means that fewer families are now likely to move to suburban counties, and urban school divisions will find fewer families moving away before enrolling their children in school. In Arlington County, for example, 25 percent more families now stay to enroll their children in public school than in 2005. Even smaller urban school divisions, such as Norton and Falls Church, are attracting families. The increase in families staying in urban school divisions has helped fuel significant population growth in many of Virginia’s urban areas. This growth has coincided with the hardest squeeze on local government finances in decades. Many of Virginia’s local governments have been left wondering how to deliver services (such as education) to a larger population. Elementary schools have been among the first to feel the impact of the change in growth trends. Most rural and suburban elementary schools have too much classroom space because fewer families have moved to their divisions. At the same time, many urban school divisions, after decades of shuttering schools, are reassessing their capital improvement plans so they have enough space for the increases in enrollment. Arlington County is a case in point. 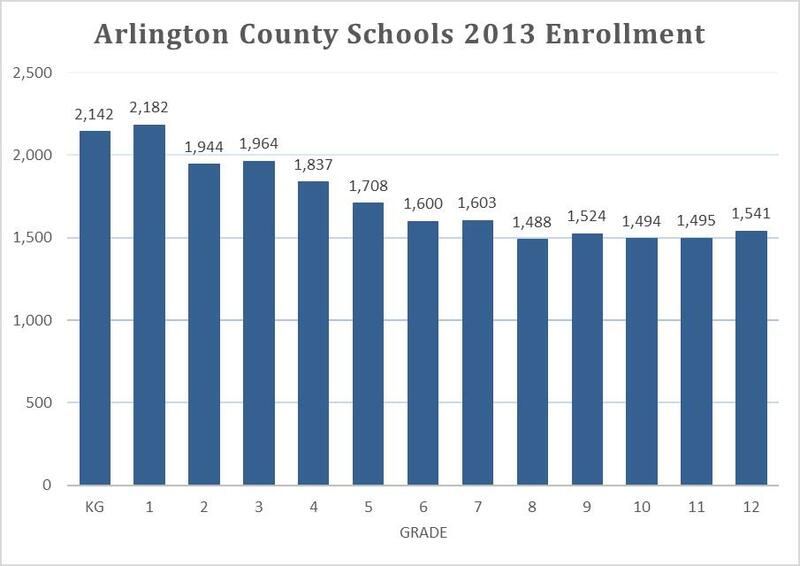 Arlington County Schools’ enrollment was flat for decades, with less than 60 percent of children born six years earlier enrolling in first grade. But among the children who enrolled in first grade, their grade size didn’t decline significantly until high school, as parents were reluctant to move once their children started school. Now, with considerably more parents staying to enroll their children in first grade, Arlington County expects most parents to also keep their children enrolled as they progress through the grades. The County projects school enrollment will rise 50 percent between 2010 and 2023, and plans on spending half a billion dollars on construction projects to help house the new students. Despite many other urban school divisions also embarking on construction projects to increase their classroom space, the question remains, how permanent are these new demographic trends? It is commonly argued that though urban areas offer many amenities for young people, when they start families they will find suburban areas that offer more space and newer housing. Urban areas typically have smaller, cheaper homes, many of which are rentals. In the current period with tighter mortgage regulations and rising college debt, smaller affordable homes can be attractive to young families whether they are buying or renting. Most urban school divisions in Virginia have high retention rates after first grade. If parents are reluctant to move once their children have started school, then most urban school divisions will expect their enrollment to continue to rise as elementary school students progress through the grades. An increase in families staying in urban areas would mean that local governments will have a lot more to plan for than just classroom space.